Winter RVing is an acquired but addictive taste. While “snowbirds” head south to warmer climates such as Florida's as soon as fall passes, others relish the sensory deprivation that winter camping affords. Modern RVs are equipped to deal with colder temperatures, and the payoffs are lighter traffic on the roads and the pick of spots at campgrounds. For short trips, many winter RVers drain and close off their water system entirely, carrying water in portable containers instead. For longer adventures, preparing the RV's water system, including pipes and tanks, is essential. 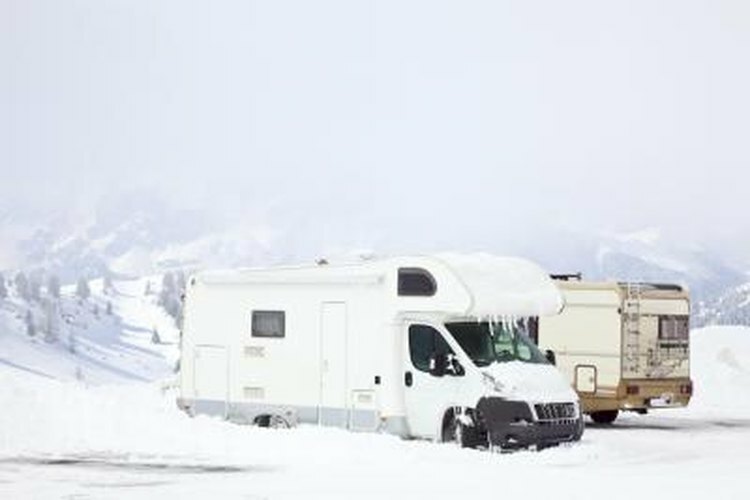 Some RVs have heated water tanks, but if yours does not, add a couple of quarts of RV antifreeze to both blackwater and graywater tanks, taking care to run the antifreeze through any pipes which extend below floor level, such as the shower P-trap. If you winterize, take bottled water to drink and brush your teeth. A neat trick if you have an RV with several exposed pipes is to leave a faucet dripping, which will at least keep water running through the system and alert you if the water starts to freeze solid. It is also worth taping up any exposed pipes with heat tape before departure, although most modern RVs place pipes adjacent to heat ducts. Pick a spot that catches the sun and has a natural windbreak, such as hedges or trees, and park the RV with the front or rear facing the wind, rather than letting the longer sides catch the full brunt of the chill. If parking up for a while, placing skirting around the RV’s base will help keep the undercarriage area warm and protect the pipes. As soon as you’re set up, either connect the electrical system to the hookup to turn on the heating system, or heat water with the propane gas tanks. If the shower and bathroom facilities are open in your RV park or campground, use them rather than filling up the graywater tanks, even if it means a chilly trek to the shower block. Even if you are entering a campsite under benign conditions, don’t forget to visualize the return journey after snowfall. Since the RV’s forced air furnace will provide the primary source of heat, make sure your propane tanks are full before setting off, because the heaters will consume more gas than cookers or other appliances. Watch out for the furnace fan draining the batteries, too, if not hooked up to an outlet, since it draws up to 7 amps, bearing in mind that even batteries can freeze in cold temperatures when not fully charged. Cold batteries also draw more power to start up. Coating the terminals with petroleum jelly helps ignition. Make sure you have carbon monoxide monitors in the cabin when running propane heaters. If no electric hookup is available, a generator is a huge bonus. It will keep the batteries charged, but make sure the exhaust is well ventilated and be prepared to put up with a fair bit of noise. If you don’t have thermo-pane windows, keep them covered with curtains, and seal roof vents and skylights to minimize upward heat escape. Sheets of Styrofoam also make easily removable insulators for windows and the main windshield, while strips of insulator around entry doors will also minimize the main source of drafts. Have a set of snow chains on board; they are obligatory in some states. Even if you’re not planning to head into snowy areas, you never know when you might be caught in a blizzard. RV Travel recommends investing in a portable dehumidifier to dry out the cabin before leaving, since wood cabinets in particular can accumulate moisture during summer, which will cause condensation when it's cold.